An original letter of correspondence between brothers and business partners Joshua Coffin Chase and Sydney Octavius Chase. Topics discussed in the letter include the analysis of Isleworth Valencias produced at Isleworth Grove, the comparison of said variety with other varieties, and hiring Stillwell & Glading to conduct the analysis. 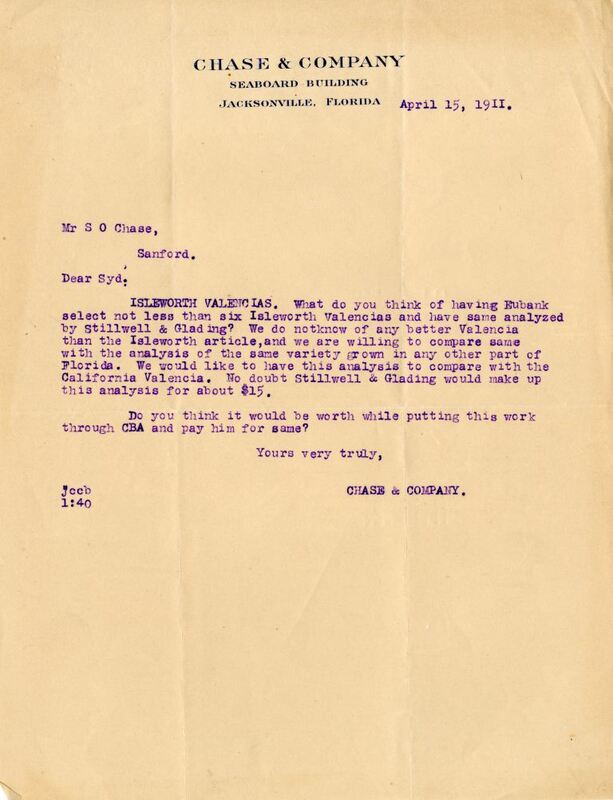 Original letter from Joshua Coffin Chase to Sydney Octavius Chase, April 15, 1911: box 49, folder 20.84, Chase Collection (MS 14), Special and Area Studies Collections, George A. Smathers Libraries, University of Florida, Gainesville, Florida. 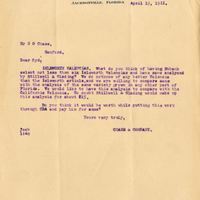 Digital reproduction of original letter from Joshua Coffin Chase to Sydney Octavius Chase, April 15, 1911. ISLEWORTH VALENCIAS. What do you think of having Eubank select not less than six Isleworth Valencias and have same analyzed by Stillwell & Glading? We don notknow [sic] of any better Valencia than the Isleworth article, and we are willing to compare same with the analysis of the same variety grown in any other part of Florida. We would like to have this analysis to compare with the California Valencia. No doubt Stillwell & Glading would make upt this analysis for about $15. Do you think it would be worth while putting this work through CBA and pay him for same? Chase, Joshua Coffin. 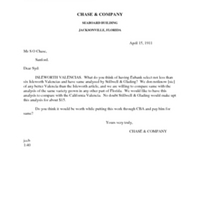 “Letter from Joshua Coffin Chase to Sydney Octavius Chase (April 15, 1911).” RICHES of Central Florida accessed April 19, 2019, https://richesmi.cah.ucf.edu/omeka/items/show/2703.